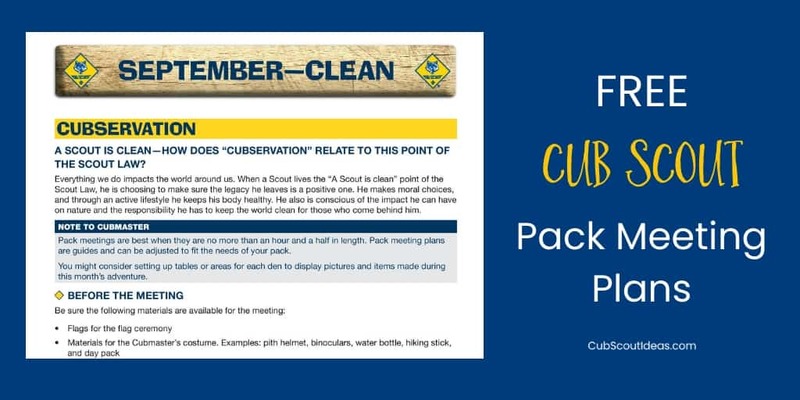 Cub Scout pack meeting plans save time when you’re preparing for your meetings. Developed by BSA, the plans are a FREE resource for us. Cub Scout monthly themes are fun for the boys and easy for us to execute. In the past, BSA developed Cub Scout pack meeting plans for us to download and use free of charge. There are plans for each point of the Scout Law. The plans are created around the Cub Scout monthly themes. Although they recently decided that they would no longer produce new monthly themes with corresponding plans, we can still use the old plans. Below, you’ll find links for the plans for 2015-2016, 2016-2017, and 2017-2018. The great thing about having access to prior plans is that we have multiple plans for each point of the Scout Law and the Cub Scout monthly theme isn’t the same. For example, you’ll find more than one Clean plan, more than one Reverent plan, etc. Choose the one that best fits your needs. I reviewed the three monthly themes/plans for Clean. The one from 2015-2016 is “Cubservation” which focuses on keeping the outdoors clean when we are hiking or camping. The meeting closes with everyone saying the Outdoor Code. 2016-2017’s monthly theme is “A Picnic with Pizzazz.” The focus is on keeping our minds and bodies clean with good food and exercise. This plan is perfect if your pack is planning a picnic**. The 2018 monthly theme is “Destination Parks” which discusses keeping our natural parks clean. This is similar to the Cubservation theme, but it focuses a bit more on local green areas rather than the world at large. The activities are different too. Use these Cub Scout monthly themes for other events too. For example, if you are having a medieval Blue & Gold banquet theme, check out the November 2016 plan for ideas. **Note about pack picnics: If you are having a pack picnic, let your den leaders know. There are several adventures that have either food- or cooking-related requirements. Here’s a list for your convenience. These plans are a great resource for den leaders too. They may want to use some of the activities for their adventures. For example, the gathering activity for the October 2015-2016 meeting is to make superhero capes. That’s perfect for the Webelos and Arrow of Light elective adventure, Build Your Own Hero. In addition to helping with an entire meeting, these plans also allow you to pick and choose activities for den meetings or other events. If you don’t have many gathering activity ideas for your den meetings, you can use these. Need ceremony ideas? Pull them from these plans. You can find the Cub Scout pack meeting plans on BSA’s website, but I’m also posting them here for your convenience. Trustworthy "Let the Games Begin" "Cub Scout Investigators" "The Great Race"
Loyal "Our National Treasures" "Cubs in the Future" "Scout Salute"
Helpful "To the Rescue" "Jobs, Jobs, Jobs" "Cubs in Action"
Friendly "#CUBSCOUTS" "Treasure Hunters" "Friends Near and Far"
Courteous "Cubs in Shining Armor" "How the West Was Won" "S'More Cub Scout Fun"
Kind "Creepy Crawlers" "Paying It Forward" "My Animal Friends"
Obedient "Cub Scout City Council" "Wheel into Summer" "It's a Hit"
Cheerful "Celebrate" "Abracadabra" "Strike Up the Band"
Thrifty "Power Up!" "A-Camping We Will Go" "Cubstruction"
Brave "Roaming Reptile Alert" "Home of the Brave" "Super Cub!" Clean "A Picnic with Pizzazz" "Destination Packs" "Cubservation"
Reverent "Passport to Other Lands" "Cubs Give Thanks" "Winter Wonderland"
These next four plans are not specific to the points of the Scout Law, but there are some good activities in them. Health & Fitness - "Backyard Fun"
June: Perserverance - "Go for the Gold"
Courage - "Under the Sea"
What do you think? Will having these plans make your pack meetings easier and more fun? P.S. Need resources for skits, jokes, and run-ons? Check out these books by Thomas Mercaldo! I own several of them, and they’re great! P.P.S. These meeting plans are copyright of the Boy Scouts of America. The links to them are posted here for your convenience. « What are the Cub Scout Whittling Chip Requirements? I like the new rank advancement ceremonies for each month, but in the new program, there shouldn’t be any rank advancement until much later in the year. Am I missing something? If you don’t have any awards to present, you can skip that part. But, there are a few situations where boys may be able to complete adventures prior to the September pack meeting. In our pack, we don’t have den meetings in the summer, but many of our boys attend Cub Scout day camp where they can work on adventures. If any of your boys go to Cub Scout or Webelos resident camp, they are likely to have finished some adventures. If your September pack meeting is at the end of the month, they may have completed them too. When you take the flag out at the end of a Pack meeting, you RETRIEVE the colors. Retiring the colors means you are going to destroy the flag by burning or burying the flag. It’s a common mistake, but needs to be corrected. Hi, there! Are you seeing this in one of the plans themselves? If so, you would need to contact the BSA directly. They are the ones who created these. I’m glad you told me this! I’ll make sure that anything I do says “retrieve.” Thanks! THANK YOU! I couldn’t find these today and panicked! I sure appreciate your update info and easy access! I’m NOT creative so really rely on these resources. I agree, that there’s plenty from the past to go off and slightly tweak if necessary. Again, THANK YOU!